A mix of an aquaculture system and hydroponics is known as aquaponics. It is a system that uses the best of both without the use of chemicals and ensures healthy growth of the fish. Bluegill aquaponics is one of the most widely used systems as the fish itself has a high demand and it is easy to manage. The information below will help show you why bluegill aquaponics is popular and why people prefer to use it instead. One of the most popular fish among fishers, the bluegill is a small freshwater fish that measures around 5 to 12 inches and can weigh less, sometimes more, than a pound. The fish is oval-shaped and dark greenish in color along with dark bars going in the vertical direction. There is a black earflap behind its eyes as well. You can easily identify female bluegill by the yellow color of its belly, while the male has a red belly. The mouth of the fish is quite small, and it has 2 dorsal fins. Bluegills are native to North America but now can be found almost all over the continent. They like to live in places where the water is shallow with lots of vegetation and hiding places for protection such as logs. Bluegills are one of the best fish to raise in an aquaponics system mostly because they are known to be quiet sturdy. They can also live easily with other fish. It is a known fact that they have survived well with largemouth bass, catfish and goldfish as well. Being an omnivorous fish, you will need to take special care of its food while raising bluegill aquaponics. In lakes and other places, you will find these fish feeding on various insects, snails, zooplankton and other fish and their eggs. If there is little or no food, they will resort to eating vegetation and algae. They tend to mostly feed at dawn or dusk. Baby bluegills (those that have just hatched) tend to eat mostly zooplankton. Those fish living in bluegill aquaponics will need to be fed by you. You can find ready-made fish food in the market or make and give them food yourself. Remember that being omnivorous means that they do not need a lot of protein; about 30% will do in their diet. 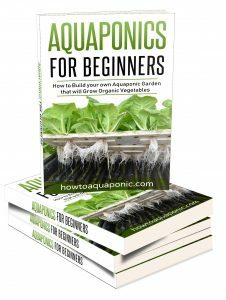 If you want to improve their growth in aquaponics, you will need to feed them a few times a day. Their growth will also depend on how big your system is and how many fish are in it. The fewer the fish, the more the existing ones will get a chance to eat and grow bigger. One key point to remember is that juvenile bluegills will need more food than an adult (about 7% of their body weight). The temperature of bluegill aquaponics is easy to maintain as they do best in cold water. They can also survive just fine in warm water, making it easy to regulate the temperature. However, they will be unable to survive in hot water. The only two factors that you need to pay a lot of attention to are the pH and oxygen levels. 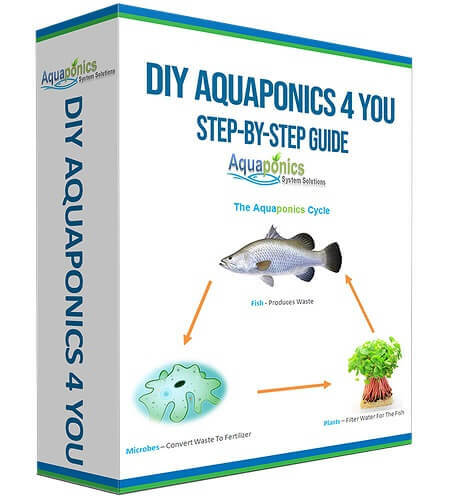 To ensure that your fish does well in aquaponics, you need to ensure that it has lots of oxygen (higher temperature levels will lower the level of oxygen in the tanks), which is why you will need to take extra care in summer. Make sure that the pH levels do not go under 6 and that they do not change drastically, which it tends to with the changing temperature. The main aim of any person breeding bluegills is that they reach the size of a plate. They will not grow more than 12 inches, so the good part is that these fish are small enough to fit in small DIY fish tanks. If you provide sufficient food, you will see that they grow big rather quickly. It will take them about 2 years to reach breeding size and with proper feeding, they will grow up to a pound in just a year with the right conditions. 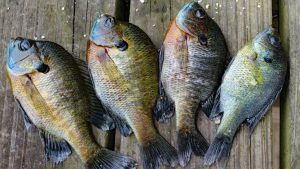 Even though there may be just a tiny difference in the appearance of the tilapia and bluegill, a trained professional will be able to identify the fish. The main difference is that the tilapia is a part of the cichlid family, while the bluegills are sunfish. The two fish taste completely different as well. You will also find tilapia to be a bit bigger and heavier than bluegill. You will not find much difference between these two fish mostly because they come from the same family, the sunfish. However, the main difference lies in the taste and appearance of the two fish. 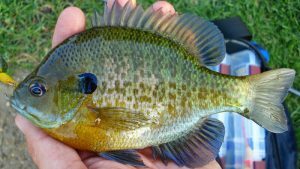 Both are considered to be panfish, but the crappie can grow up to 19 inches long and can live up to 15 years, while the bluegill is quite the opposite of this. One thing you must remember about the bluegill is that these fish tend to nest in groups, so they need some competition in order to entice breeding. The nests are close to each other and the male fish is the main protector of those nests. This is one of the major reasons why bluegills are one of the most difficult fish to breed in captivity. Either you will need one big tank for all the fish, or you will need to get many small ones and place them close to each other so that the fish can see each other. Smaller tanks will make sure that the fish do not fight with each other. You will need to prepare the bottom of the tanks with small rocks, gravel and/or wheatgrass along with nesting materials so that the fish are able to dig their nests. You will then need to place a grow light so that the plants inside the tanks can thrive. The water needs to be cold and the temperature needs to be maintained so that they do not suffer or die. Lastly, you will add a male and female fish to each tank. The breeding process will then start on its own. Make sure that the pH levels are also maintained and the fish are properly fed. The thing with bluegills is that if you keep them in the same tank as the eggs, once they hatch, the adults may turn a little cannibalistic and eat their young ones. Hence, once the eggs have hatched, it is best that you separate the little ones and adult fish altogether. They are easier to handle as they are small and can adjust to different temperatures. They are easy to harvest. They have a good growth rate. The development of bluegill in aquaponics is also good. 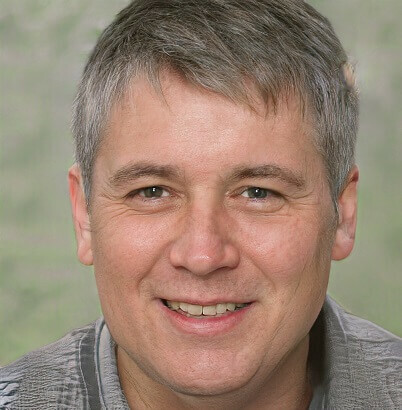 When breeding, they tend to develop cannibalistic instincts and eat their own babies. Thus, it is important to separate them and as a result, you will need extra tanks. Bluegills don’t have much of a preference when it comes to eating. They are omnivorous fish which like to feed on zooplankton, small insects, snails, small crayfish, other small fish, fish eggs, and worms. If you were to throw some of your own food scraps into the water (such as crackers, bread or corn), they will eat them too. How Big Do Bluegills Get? Bluegills are big enough to easily fit into your frying pan. They are small freshwater fish that measure from 6 inches up to 12 inches. One of the biggest ones was about 16 inches. These fish tend to weigh less than a pound (mostly). The bluegills are among the tastiest fish that you can find and are absolutely safe to eat. You will find them to be white, flaky and mild in texture and taste. Wild fish caught will taste about the same as commercially produced/bought. Although, the wild ones may prove to be a bit healthier. You will find that the bluegill grows rapidly in the first three years, but as soon as it reaches maturity, its growth slows down. Most fish tend to reach 5 to 8 years of age. There have been some instances where the bluegill has been known to live up to 11 years. However, its average life expectancy is 6 years. Factors like the environment and availability of food also play a role in determining their life expectancy. There have been claims that say that the bluegill is a dangerous fish, but there is no evidence that proves otherwise. Even though it has teeth, they are made to rip apart smaller prey. Hence, you don’t have to be worried when keeping bluegill in your aquaponics system.